The two people sitting across from me, ARKO + OWL, are an artistic duo who set out to find love in each other and with the city of Charlotte. They were chosen as the first artists to be featured in The Mint Museum’s newest project, ConstellationCLT. Every year The Mint Museum will highlight approximately three contemporary artists in the Charlotte region to showcase their distinct works of art. Having just finished painting for the night, the two enter the room beaming with unfiltered joy and happiness. They graciously meet me at Mint Museum Uptown, site of their most recent mural, to sit down for a chat about their career as artists and their views on the community that Charlotte is beginning to build. “Why the mask?” I start with the most obvious question. The two, though unmasked when sitting in front of me, prefer to conceal their identities when posting online or doing public events. With the mask, OWL feels that she could make things more freely than without it. “I can fully embrace my art,” she says, “and then when I overhear someone say something critical, it’s a little less personal. It’s not directed at me. They don’t know that I’m standing behind them and they don’t know who I even am. At that point it is all about the art that they see in front of them.” The words of criticism are relevant in a way that separates her feelings of being connected to the work from being a part of the work itself. Freely losing one’s sense of self in the artistic process is what propels that same art to the forefront of the collective imagination. Raw feelings of the human condition are brought forth from artists that are allowed to embrace the intricate details of love and loss; of joy and anguish. Art of that substance acts as a reflection of the person standing in front of it, as well as a reinterpretation of the artist that made it. Seeing that reinterpretation and hearing its voice is indicative of the overreaching power of art to bind people together. Art allows others to connect with people who seemingly would never have been able to before. Cultivating a sense of understanding in all people is what brings gravity to a work of art. Common ground shared among people different from one another erases boundaries of isolation. It forms strings of connectivity that pull on the human vital of compassion. “Community, much like culture, is what you make of it,” says ARKO, “we are at the beginning of a really big push right now. And It’s not just us, it’s everybody. Everyone who is out doing pop-ups, doing stencils, doing graffiti, everyone showing in galleries.” Everyone who is striving to put art out into the city of Charlotte. Everyone, he seems to be suggesting, who is working toward that same goal of using art to bring people together, both physically and ideologically. “I went to art school, I showed in galleries, I did the whole academia thing,” ARKO says, specifically recalling his interaction with the traditional structures surrounding art institutions, “but personal success isn’t what all of this is about to us. We want to bring this art to everyone and to let those voice of the minorities be heard. Not just the people that are traditionally held up as artists.” ARKO originally rejected the ideas of tradition, but says he is coming back around to it and is now looking to build upon them to form a new meaning around art. There is an evolution of traditional spaces, he says, that can be utilized to educate people about different ways of thinking and living. He describes art as an open door to other people’s worlds; a way to see things from a different perspective. Specifically, he wants to bring people, art and happiness in any way possible; whether that means working with traditional museums or utilizing Instagram to give away free art. ARKO + OWL are both taking note of Charlotte’s lack of representation, and they hope to help bring those voices that are traditionally silenced to the forefront of the conversation. Charlotte is currently in a unique position of having the opportunity to develop a new definition for itself, one that could include everyone’s voice. The duo hopes to capitalize upon this to help make diversity a large part of the new culture that is emerging in Charlotte. The installation at Mint Museum Uptown lies in the same contextual vein of equal representation within the city. The pair said they immediately rejoiced when they were contacted about the mural at the Mint, but more for the vocalization that the mural is giving minorities rather than their personal success. Like the painting of the Hyatt’s windows, they viewed this too as a start to bringing a level playing ground to the Charlotte art scene. Progress of building upon and moving on from traditional viewpoints lies in the collaboration between institutions of long-standing reverence and independent artist like themselves. They say they are excited at the prospect of institutions being willing to reach out and work with local artist to bring in fresh voices. “I think it’s amazing that we get the chance to help break down the assumption that there is a corporate world in Charlotte that doesn’t interact with the real people…I am in awe that I am literally drawing with a marker on the walls of a museum. Its completely crazy.” Together, both ARKO + OWL and the Mint hope they can elevate the voices of the people they serve. Working with one another can allow the artist and their art to present a new face to the Charlotte that looks like them; to a Charlotte that is culturally rich, ethnically diverse, and welcoming to everyone who wants to call it their home. 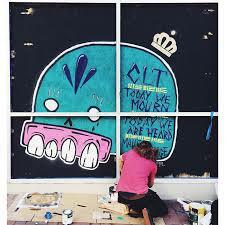 ARKO + OWL have multiple installations inside of Mint Museum Uptown that are going to be featured in the Talking Walls Mural Festival, October 10-13, as well as serving as the launch of the Mint’s ongoing ConstellationCLT project.